If you’ve done any research on how to eat healthy and/or lose weight, then you’ve probably heard it is best to pack your lunch. It makes sense. When packing your lunch you are 100% in control of what you’re eating. You can choose healthy ingredients, ensure you’re getting the right number of calories, and keep your macros in check. But what’s seldom talked about is the importance of packing snacks. In fact, I believe it is even more important to pack your snacks than it is to pack your lunch. Why? Read on. The basic premise behind why packing your lunch is important is that your packed lunch will be more healthy than what you could buy. And while that’s true, I believe it is still possible to buy a healthy lunch. Buying lunch doesn’t have to mean a burger from a fast food place. Or a couple slices of pizza. Healthier options are readily available. Example: here are some lunches that I buy when I don’t pack a lunch: big salad with grilled chicken (dressing on the side so I control the amount), hearty soups like salmon chowder and chilli, sushi. Heck, even a deli sandwich can be healthy. But have you ever tried to buy a healthy snack? It’s nearly impossible. First, let’s define what a snack is. Generally, a snack contains between 150 and 300 calories. Ideally, it has at least some protein and very little sugar. And hopefully very few chemicals. Using that definition, it is difficult to find something appropriate to buy. A muffin, pastry or donut? Too many calories, not enough protein and way too much sugar. Anything from a vending machine? Same challenge. Even most commercial granola bars have too much sugar (not to mention all the chemicals, GMOs, and other ingredients I wouldn’t want in my body), and not enough protein. 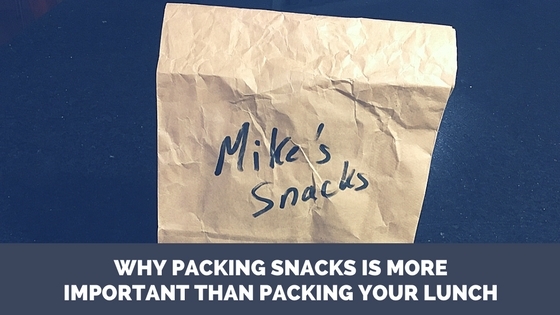 That’s why I always pack snacks, even if I plan on buying my lunch. Because I know that if I buy a snack, it’s not going to fit well into my eating plan. Some of the snacks I often pack: protein bar (look for ones without soy and a limited number of ingredients in general), apple and cheese, plain greek yogurt and berries, leftover steel cut oats with some raisins and pumpkin seeds, Shakeology (I keep a blender at work just to blend my Shakeology snack with ice to make it super yummy), overnight oats, homemade trail mix (some raisins, almonds, a raw cacao nibs – just watch the quantity of each! ), and raw veggies and hummus. If for some reason I absolutely have to buy a snack, then I will often buy a latte (made with 2% milk because I want a little bit of fat). A latte generally fits my healthy snack criteria. Plus it’s coffee which is always welcome! Just don’t load that latte up with sweeteners. To summarize: buying a healthy snack is difficult. And to stick with healthy eating habits, we don’t want to add difficulty into the mix. So regardless of whether you’re going to pack of buy your lunch, make sure you pack your snacks!